The Pacific Okinawa Players is staging youth production ‘Harmony High,’ a high-energy musical for the whole family starting tomorrow at the Camp Foster Community Center Auditorium. Harmony High boasts clever original songs, zany antics, and a creative script for a truly spectacular show that will have everyone singing, including the audience! Written by John Jacobson and Mac Huff, this cast of kids can’t get enough of this “way out” school where everybody sings and everything’s cool! The play follows new students Michael, Michele, and JR as they sing their way through their first day at Harmony High! Harmony High is the 10th POPs show directed by Christine Smith, who last year directed Disney’s Peter Pan Jr., Disney’s Aristocats Jr., and A Midsummer Night’s Dream. Harmony High’s choreography is by Susan Parda-Watters, whose past works include You’re a Good Man Charlie Brown, and Disney’s Peter Pan Jr. The musical direction is by Melanie Bales. 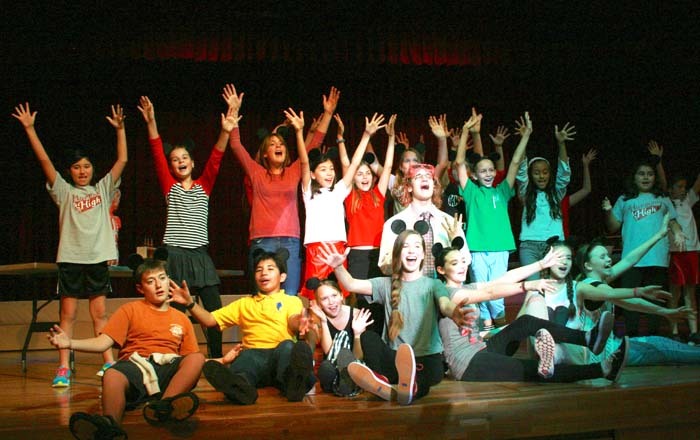 The cast consists of 34 youths aged 9 to 17 including Colin Lundberg as Michael, Ellie Dolan as Michelle, Lindsay Dolan as JR, and Tori Pickens as Principal Smith. Harmony High will run on Friday, Saturday and Sunday for two weekends on Feb. 19-21 and 26-28, with 19:00 performances on Fridays and Saturdays and 14:00 matinee performances on Saturdays and Sundays. All performances are at the Camp Foster Community Center Auditorium. Tickets are $5 and can be purchased at the door. Admission for children under three is free. For more information please visit POPs’ website.